Ashbee was a British Architect and designer, as well as a trained and renowned silversmith and jeweler. 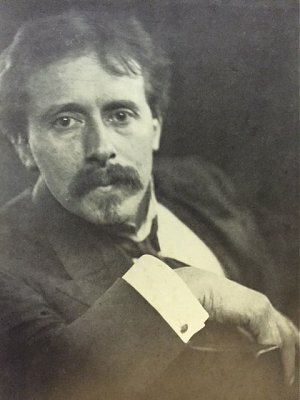 Born in Iseworth, and educated at Wellington and King’s College, Cambridge, reading history, Ashbee went on to be an apprentice for G.F Bodley for two years, completing his studies in 1885. Here, he lived at the University settlement at Toynbee Hall, London, founded by C.S Barnett, where he was in fact the only architect in residence. It was during a reading class on Ruskin that he had initiated, that he envisioned such scope for the theory and peers, which in no time at all evolved in to an art class, where he taught the subjects of drawing and decoration. Amongst his wistful comrades, formed a group, which in 1887 began the School of Handicraft. This ricocheted into plans for The Guild of Handicraft, where once more Ashbee was at the heart of its design (1888). Most fondly known for its collection of metalwork and jewelry designed by Ashbee, it gained an impressive reputation for custom made furniture for the likes of the Grand Duke of Hesse to name but one. The workshop at Essex House, a Georgian mansion on the Mile End Road in London, is also known for the location in which Ashbee established the printing press used by Morris at Kelmscott House. Essex House was leased for retailed business in 1890. Subsequently, the Guild of Handicraft relocated and began functioning again in Gloustershire in 1902. Here, Ashbee had familiarised himself with entire communities and villages of which the Guild could adopt and train as Guild workers; the worker’s families would learn the craft and the compatible companions were able to perform discourse on the subject amongst their everyday lives. Tragically, in 1907, the Guild went in to liquidation due to a high level of financial outgoings, this we imagine was quite disheartening for the workers, moreover, a vast number of them continued to work independently, some of which included Ashbee’s designs in their practice. This minor pitfall in Ashbee’s career encouraged the rebirth of his architectural training, which had been abandoned a few years back. Typically, his designs were an endeavor to escape historicism and his immediate predecessors. 1895 saw the completion of his house ‘Magpie and Stump’, built on Cheyne Walk, London; a glorious explanation of his concept, in all its magnificence, it stood quite clearly for the variation of historical and modern styles in collaboration, forming what we recognise now as 1970s taste in fashion, yet he was not to know that he was so ahead of his time. Ashbee was a recruit to the cause of architecture, socialism, and the crafts after Morris. The experiences he acquired working at Essex House gave him the lead and strongest knowledge of the realities of the working class within the Arts and Crafts Movement. According to Ashbee, a craft could only be mastered through trial and error, which lead to the finding of individualistic styles derived from teamwork and shared experience. Style and character were essential to recognising a designer, and equally to establish a market to flourish around ones practice. He notes in Modern English Silverwork how ‘it is the learning how to do things and do them well, that many fresh design motives are evolved..to trust each other, to play into each other’s hand, and understand each other’s limitations..’, these ideas depict how indispensable ‘humanity and craftmanship’ are in a movement such as Arts and Crafts. ‘..the modern cry for the education of the hand and eye can only be fully achieved in the education of the individuality of the workman’. This part-quotation supports his beliefs that one must conceive the design in the elementary stages and then apply this to material, in order to follow the leading artists that had ‘the encouragement of the handicrafts at heart’. Not dissimilar to Godwin, Ashbee was able to heighten the beauty of an object, rather than ‘hiding it under a superfluous mass of applied decoration’. These works, particularly silverware, were considered delicate, controlled and understated, which in turn he earned being referred to as ‘never a man of half measures’.